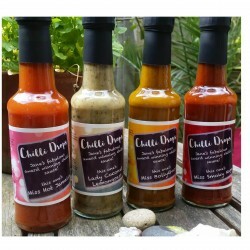 Chilli Drops are award winning artisan chilli condiments "cooked up" by artist and creator Jane De Croos in her London flat. 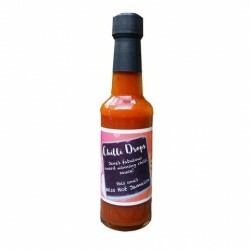 These original and exciting bottles of spice and flavour transform any dish into a delicious, lively treat for you taste buds. The perfect accompaniment for any food you choose. The four different flavours have been designed so that you will never be bored at mealtimes again! Four fantastic flavours in the family, no artificial nasties! Keep it local…keep it British!